Aamir Khan is going all out to launch his nephew Imraan Khan in Abbas Tyrewala's Jaane Tu... Ya Jaane Na, and has roped in the best to make the film successful. That would, of course, include A R Rahman. How does it feel working with Abbas Tyrewala? This is a completely new team for me. So working with him was a little strange in the beginning. Then, we got used to each other. When the music was done, Aamir was happy and appreciated it. He said that the two of us made a good team. Was it difficult working with Aamir and producer Mansoor Khan? Aamir is not difficult to work with. It's just that when he gets excited about something, he likes the integrity of the same thing. And when something goes wrong, he wants to bring the integrity back. He likes to balance the whole project. He is a great producer. Was Aamir involved in the music of his films? We last worked during Rang De Basanti [Images]. I just get just feedback from him. 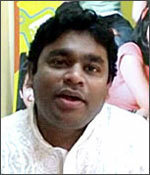 He is more involved in the music of Gajini than any of his previous films. Whats the best part about 2008 yet? The best part of 2008 for me is the launch of my music conservatory. It's very important to me, and a completely different road. I am looking forward to this exciting venture. What was your reason for opening this school? The time has come to start, so that we could have an orchestra. We have got about 1,000 queries and managing director Selvakumar is in the process of replying to it. It is about musicians. Only if you have musicians, you can have composers. [We want] to create a pallate of players for future composers. If they don't have musicians, they will make music out of computers. By this, they might lose the joy of listening to live music and composing from that. Are you scoring the music for Rajiv Menon's Dhun? Yes, we are in the process of getting it finalised. You were supposed to go to Cannes Film Festival this year. Why did you not go? That was very strange. I saw it in the newspapers. I had other commitments, and they called me on a very short notice. So I could not go.